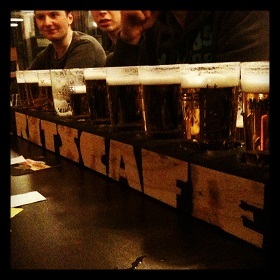 Thirsty Pilgrim: More Educational Hedonism in Belgium. Where you might like to be this weekend, given your proverbial druthers: the Alvinne Craft Beer Festival, at Brouwerij Alvinne in Moen. For pleasure and for learning. Many of the selections on the list were carefully engineered not only to please the taste buds but also to raise eyebrows. And there is much to be said for that. On the other hand, you've also got a range of fairly reasonable cask ales coming down from the U.K. To rehydrate, or to reset the palate perhaps. If you don't like the alphabet (and who does? ), one way to organize these beers could be alcohol content. In that respect, Struise provides both bookends. At the high end, it brings along what was once a blonde ale before being concentrated by fractional freezing. Now, what is it? Barley wine? Liqueur? Who cares? It's 25 percent alcohol and called 5 Squared. If I were there, I might roll my eyes right before getting in line to taste it. Then, on the other end of the spectrum, the Struise Single Black. That's "bob" stout of 2 percent strength, for designated drivers. In one place I saw this promoted as a "ridicule" stout. I'm not clear whether that was clunky English or a response from Struise toward those who would ask them for lower-strength beers. Either way, I'd be game to try it. That reminds me: I posted an updated link to Paul Briggs' studious beer festival calendar a couple of weeks ago. Out of love. On Valentine's Day. You can find it here. Plan holidays accordingly. Also, here's a bit of info from Chuck Cook on a newish and small brewery in Hoeselt, called Toetëlèr. Its flagship, of the same name of the brewery, is a Witbier flavored with elderflowers. They are doing other experiments. At Rits, there are a few commercial beers but featured breweries also include Cantillon, Senne and De Ryck. 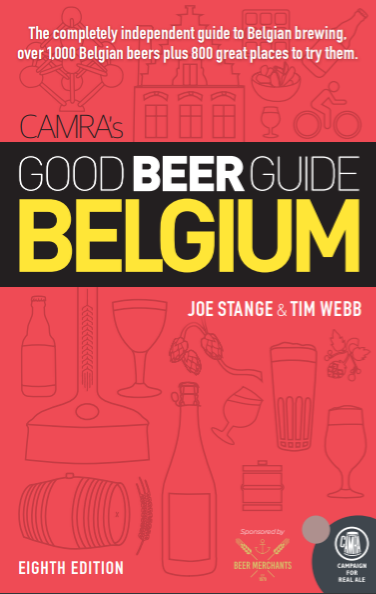 Vermeylen says that storage is an issue so the list is always changing, but soon he will add another list, the "master's choice, with a dozen rare Belgian and foreign beers." He calls it his "playground," and it promises further fun and education for the beverage-inclined. *Photo by Lena Van Goethem. Don't forget that this Saturday there is also the Open Brew Day at Cantillon. You're right... I mentioned it elsewhere but shame on me for forgetting to mention it here. www.cantillon.be for more info. Get there early for coffee and croissants.